CHICAGO (WLS) -- A Chicago man captured a unique - and somewhat eerie - perspective on an iconic Chicago building while heading into work on Friday. A Chicago man captured a unique - and somewhat eerie - perspective on an iconic Chicago building while heading into work on Friday. Zach Gingold, of Wicker Park, said he noticed the Willis Tower's shadow on the low cloud deck around sunrise. 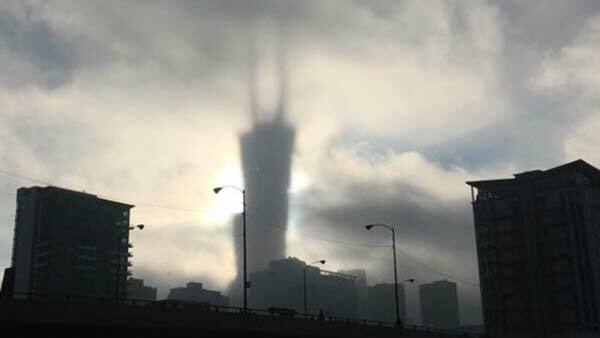 The low angle of the sun cast a larger-than-life silhouette that loomed over the surrounding buildings. Gingold said he enjoys photography as a hobby, particularly taking pictures of Chicago and the sky.